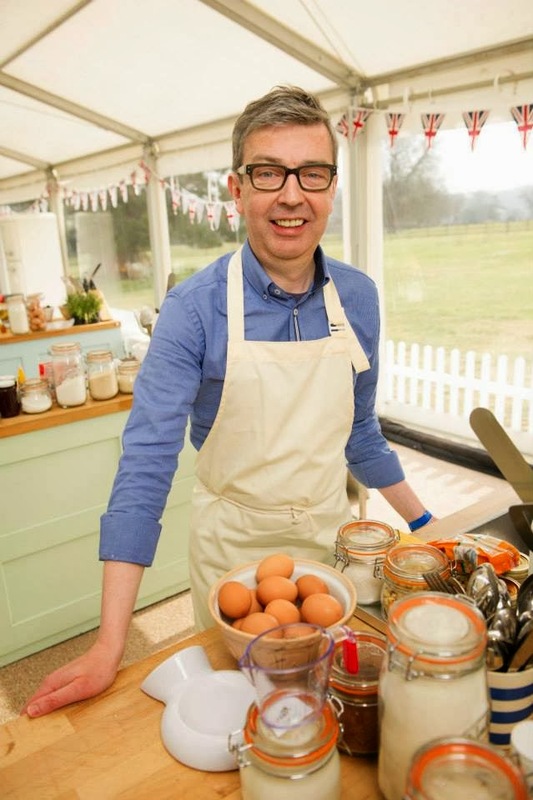 Bit of a late round up for last week’s GBBO as I’ve been busy baking for Macmillan, but hopefully it will refresh your memories in time for tomorrow’s new episode! Sweet dough was last week’s theme and the first challenge was to make a tea loaf, which is a sweet yeasted bread, traditionally served at tea time and flavoured with fruits and spices. Adding eggs, butter or sugar to dough can be problematic as it can ‘retard’ the yeast. This means that the activity of the yeast, and therefore rising of the dough, is slowed down. 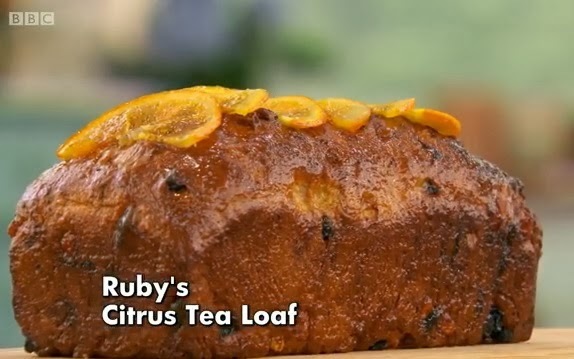 The only baker that got full marks on this challenge was Ruby, with her Citrus Tea Loaf. Paul and Mary loved the deep citrus flavour and thought it looked great. Glenn, Christine and Kimberley’s tea loaves were all underbaked, although Christine faired worse as the judges didn’t even eat any of her mostly raw loaf! Beca made a traditional Welsh Bara Brith. Frances made a Chai Tea Loaf that finally had much more substance than style! And poor Howard got bad results with his Date & Hemp Yorkshire Loaf. 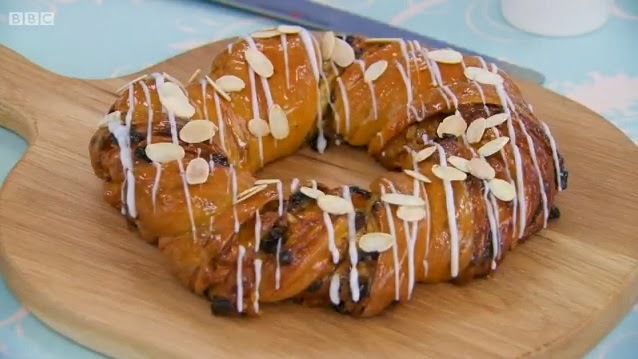 The signature challenge this week was an Apricot Couronne, using a Paul Hollywood recipe. This is an enriched dough, filled with apricot, marzipan, walnuts and raisins. It is then twisted into a crown shape. 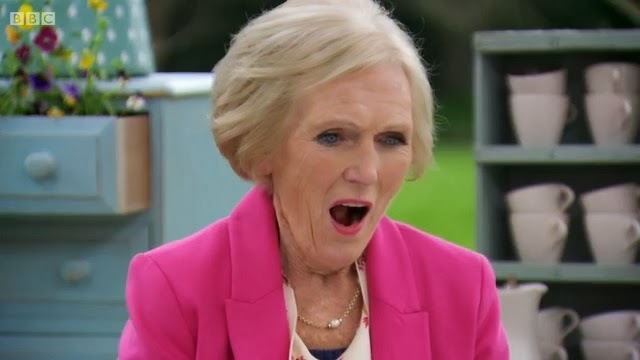 I just had to feature Mary’s face when Paul revealed his Couronne from under the silver dome, she loved it! The baker’s were not told how long to prove or bake the Couronne for. However despite this, they all did very well on the challenge! All the Couronne’s were baked well and tasted good accordingly to Paul. The mistakes made were minor, and unfortunately for Howard he came last, with Glenn and Beca not far behind. Ruby won the challenge, with Frances second and Kimberley third. The Couronne is finished with a drizzle of icing and flaked almonds sprinkled on top. If you fancy making one, you can get the recipe here. The showstopper challenge started the night before so that some of the baker’s doughs could prove overnight. 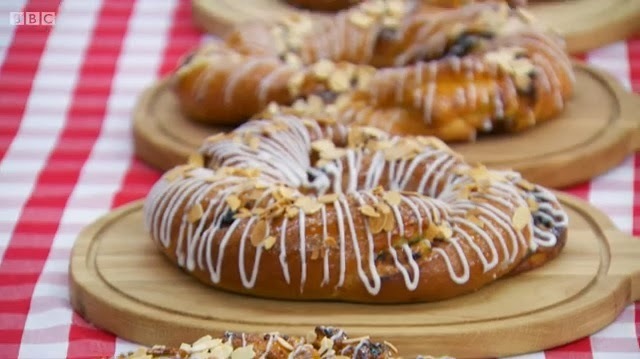 The judges requested two different varieties of European sweet buns. Several of the bakers made brioche, which is enriched with butter and therefore requires a long chilling time so the dough is easier to shape. The bakers introduced us (well me for sure!) to a variety of European breads such as German Schnecken, Norwegian Skolebrod, Swedish Kanelbullar and Czech Kolaches. Frances turned her sweet buns into a game of noughts and crosses with her Hot Cross Brioche and Rhubarb & Custard Kolaches. 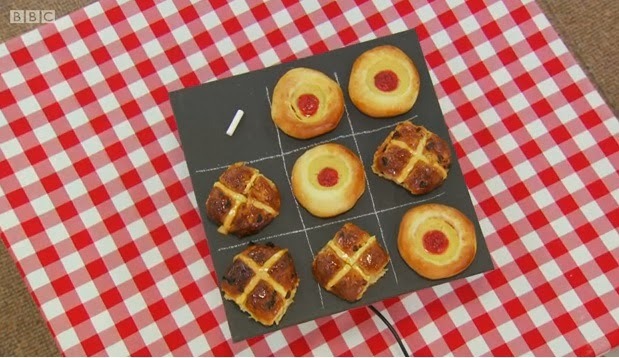 Christine, Ruby, Frances and Beca all got excellent results and were praised for good flavours, lovely textures, and well baked buns that Paul and Mary liked a lot. I was sad to Kimberley not do so well this week, her sweet buns were underbaked and underproved, the same as her tea loaf. 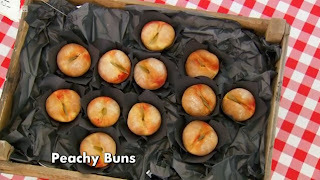 Glenn’s sweet buns “looked awful” accordingly to Paul and were dry and didn’t taste good. Howard’s buns were also branded bland and the judges could not taste the peach in his Peachy Brioche. Although even the judges were impressed with how much they looked like real peaches! Sadly it was Howard who left this week. He started off very well, but has had some hiccups along the way. I love the way he experiments with unusual ingredients and he is certainly a brave baker that will be missed! Tomorrow on GBBO they’ll be making suet puddings, holy choux buns and puff pastry. I was inspired by Kimberley and Frances’ use of chai flavours this week, and I also decided to make these rolls as I followed the same recipe last year and made Cinnamon Fruit Rolls. But my dough did not rise and despite tasting good and being edible, the rolls were not soft and fluffy like bread should be. I think that I killed the yeast early on. I really wanted to get these rolls right this year! I started by gently melting 100g butter in a pan along with 125ml semi skimmed milk. (Plus 125ml of water which I missed as I didn’t read the recipe properly – see my realisation of this further down). Once it was melted I left it to cool, when it felt luke warm, I added a sachet of dried yeast and 1 tbsp caster sugar and mixed in. I covered the pan with a plate and left it for 10 minutes. I sifted 550g plain flour into a large bowl, and added 50g caster sugar (minus the tbsp used above) and 1 tsp salt. I made a well and poured in the yeast mixture as well as 1 egg and 2 egg yolks. rise for 2 hours. My dough was quite dry and I didn’t even use all of the flour, I was confused by this but admittedly I was in a bit of a rush at the time. I made a chai spice blend using 100g light brown sugar, 1 1/2 tsp cinnamon, 1 tsp crushed cardamom seeds, 1/2 tsp mixed spice, 1/4 tsp nutmeg and 1/4 tsp ginger. I have never baked with cardamom before. I bought the pods as I couldn’t find it ready ground. I’ve since found out you can buy it from online retailers pre-ground. But here’s a simple guide on how to use the pods. I tapped the pods gently with a rolling pin until they split open and I tipped out the seeds. Discard the husks. I put the seeds in a bowl and crushed them with the end of a rolling pin – use a pestle and mortar if you have one, or even better a spice grinder. I lined a greased a loose bottomed cake tin. My dough had risen, but not as much as I would’ve liked. Still, it was an improvement on last time I made these! I melted 25g butter in a pan, and rolled out the dough to a size of about 40 x 30cm (16 x 12″). I brushed the butter over the dough, leaving a 1cm strip free at one end. I sprinkled over the chai spice blend, then brushed the 1cm strip with some beaten egg. Keep hold of the leftover egg for later. 12 rolls out of my dough. that I put into a loaf tin. I covered them and left to prove for about 1 1/2 hours. Whilst they were proving I realised…damn…I’d messed up again! I was reading through the recipe again to write up this post and realised to my horror that I’d forgotten to add 125ml water at the very beginning. No wonder my dough was so dry! I was so relieved when then puffed up nicely on the second prove! I brushed some of the remaining beaten egg from earlier over them. I baked on 180C/350F/Gas Mark 4 for 30 minutes until golden brown. The rolls puffed up in the middle like little cones and one roll even came undone and spiralled out. Despite this, I was just happy they baked well and looked lovely and golden! Plus smelt amazing! I split them open and was pleased to see soft bread texture! I sprinkled some cinnamon sugar (2 tsp caster sugar and 1/2 tsp cinnamon) over the hot rolls and left them to cool. Once they were fully cool I made some lemon icing from 65g icing sugar and 1 tbsp lemon juice, add a few more drops of lemon juice depending on how runny you want it. I think the lemon is a great zingy hit of flavour alongside the aromatic cardamom and cinnamon of the rolls. I finally feel like sweet dough worked for me. Although I have to say it is not my favourite thing to bake. It’s very time consuming, even more than regular bread. And I think you can get nice brioches and sweet rolls from good bakeries. I think I would make sweet dough again at home, but it’s not something I would do often. I loved getting to use cardamom as it’s so popular at the moment and it was great to taste it in a bake as I never have before. I now understand what the hype is all about! What do you think about sweet breads? I am also entering my Chai Spiced Rolls into October’s AlphaBakes challenge, hosted by Caroline Makes… and The More Than Occasional Baker. This month’s letter is ‘C’. Kat, I love chai spice – and I know that I would love these! Thanks for sharing the recipe!! I've never made sweet dough as it looks like too much work! It looks like it was worth the effort though and I love the use of chai spice. I think Mary and Paul would have loved it too 🙂 Thanks for entering AlphaBakes.